The name ‘Jacuzzi’, taken after its inventor Roy Jacuzzi, is synonymous with the world’s largest and most recognized brand of bath tubs and whirlpool baths and spas. A jacuzzi combines the pleasures of fun bathing and therapeutic healing in one. It was Roy Jacuzzi who first brought the benefits of hydrotherapy into people’s homes and literally transformed the lives of people – revolutionizing the way people imagine and experience water. This brought whirlpool bath tubs from the spas right into your homes, be it in your bathrooms or backyards. Today jacuzzi bath tubs can be found in homes, hotels, cruise liners and holiday resorts. A Jacuzzi tub is not just a tub with hot bubbly scented water. It is a place to gather your personal thoughts; a gathering place for family and friends and even a romantic retreat. Jacuzzi bath is water that comforts, relaxes, sustains and rejuvenates you. Jacuzzi whirlpool baths and spas are not just about getting clean; Jacuzzi celebrates water's ability to refresh and rejuvenate in inspiring ways. This informative guide to jacuzzi hot tubs and whirlpools arms you with various features to be considered while making a selection. Roy Jacuzzi introduced jacuzzi hot tubs in 1969 and was instrumental in providing spa-like rejuvenation that people could enjoy in the comfort of their homes. Primarily meant for deep massage and relaxation, jacuzzi hot tubs came in a range of models and styles to suit one’s lifestyle at competitive prices. The one distinct technology that makes a jacuzzi hot tub an invigorating experience is the jet technology. Water and air are combined in unique massage combinations to help relax, refresh, rejuvenate and reconnect. Jacuzzi tubs come in different styles. It is essential to choose one that suits your needs and fits into your existing facilities. Jacuzzi bath tubs come in different options of jets. You can select from smaller air jets that provide mild massaging features or go in for water jets that offer a more invigorating hydrotherapy. While some whirlpool bath tubs are built for one, others can seat more. The size of your jacuzzi hot tub is largely dependent on the space limitation and requirements. You can place your jacuzzi hot tub in a large bathroom, patio or gazebo. Ensure adequate ventilation so that you are not over-heated. Recessed jacuzzi tub: This style of jacuzzi tub is most suited for those with restricted space and limited budget. Most of the jacuzzi bath tub is fitted into the alcove and only the front portion is embellished with decorative finish. Typically such jacuzzi bath tubs come in enameled steel and fit normal-sized bathrooms. Corner jacuzzi bath tub: Ideal for a niche in your bathroom, the corner jacuzzi bath tub fits into suitable corner. Ensure that there is adequate structural reinforcement to support the bath tub. Regular jacuzzi bath tubs: This is a regular jacuzzi whirlpool bath tub that is fixed to the floor. The placement of the jets and their quality determines the kind of pressure that the whirlpool jacuzzi tub would provide. Superior hydrotherapy can be best felt in a Jacuzzi whirlpool bath. It is extremely beneficial for someone suffering from arthritis and diabetes. Those seeking relief from muscle tension, strains and injury would do well to soak in a jacuzzi whirlpool bath and ease their stress away. Once a jacuzzi whirlpool bath tub is installed, it becomes a permanent part of your home and cannot be easily or inexpensively changed. Hence a customer has to make informed buying decision when choosing a whirlpool bath. 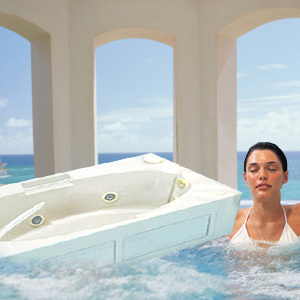 Select jacuzzi whirlpool tubs that provide hydrotherapy to different areas of the body. Varied massage options allow you a total spa experience. Typically a jacuzzi whirlpool tub must not be placed where there is inadequate support. Remember that it holds lots of water and can place substantial load on your structure. A basement with inadequate ventilation may not be best suited either. Jacuzzi bath tubs come in alluring shapes, from the regular square and round to oval or kidney shaped. You can even custom-design the shape of your jacuzzi bath tub to suit the architectural style. Jacuzzi tubs come an array of colors, from light tan and biscuit to rhapsody blue and thunder gray. Jacuzzi bath tubs come in a range of materials. You can choose from high-resin plastics, wood, enameled steel or cast iron. The interior of the jacuzzi whirlpool tubs is nearly always made of plastic. Look for one that is durable and rust-proof. It is essential that you take good care of your jacuzzi bath tubs lest they become a source of bacteria and infection. Ensure that the water is clean and with the right pH level. Cover the jacuzzi hot tub with its cover when not in use. It is likely to collect dirt and may be a security hazard with little children around. In jacuzzi whirlpool baths, the pumps draw out water and circulate it in jets. Different styles and models differ in their configuration of pumps and jets and re-circulation systems. Their prices hinge on these various features as well as other accessories that you would choose to install with your jacuzzi tub. There is abundant choice of accessories that come with the jacuzzi tubs and whirlpool baths. These include pillows for the neck, underwater light, heater, liver drain kits, hand rails, control panels, trim kits, optional skirt and rainbow fill spout trim kit. You can get a portable bar or drink holder installed with your jacuzzi tub. A stereo system with your jacuzzi bath can give you the ultimate relaxing ambience – soothing music while you enjoy the soft effervescence or stimulating jets of water in your whirlpool jacuzzi tub. Ozone systems can aid in eliminating bacteria and harmful chemicals. Filters and cleaners allow you to sanitize the whirlpool jacuzzi bath and keep it odor-free. Clean your jacuzzi bath with a spa vacuum that keeps it free of debris. Jacuzzi hot tubs come with many added features and it becomes confusing for a wannabe buyer to sieve through all the information. Top-end home jacuzzi spas come with spa ozonators, aromatherapy fragrances and enhanced filtration methods. However it is imperative that few key features are kept in mind before making a choice. Improve blood circulation with a relaxing hot tub soak. Jacuzzi hot tubs are ideal for meditation as well as relaxation and aquatic exercises. Do not combine alcohol and jacuzzi hot tubs. First Published Date: Nov 19 2006 Last modified Date: April 18 2019 This page may have been updated recently as new information is available or the content may have been edited for better readability.